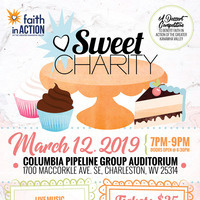 Sweet Charity is a light-hearted, friendly dessert competition, pitting nine area confectioners and chefs against one another as they vie for top honors. Our panel of Celebrity Judges - to be announced soon! - will select winners in three categories: Presentation, Creativity, and Taste. Every ticket holder attendee gets to have their say, as well. After sampling the wares as offered, your ticket stub serves as your VOTE. You'll drop your vote in the ballot box provided at each competitor's display and at the end of the evening, the coveted People's Choice award will be bestowed. Returning entrants include Sugar Momma Sweets, Delights by Davis, Edgewood Summit, and reigning People's Choice Award winner, Rock City Cake Company. During the evening, host Adam Harris will guide us through the evening, which will feature live music by the fabulous Steve Himes, lots of samples to be tasted, and fun! There is sure to be lots of laughter, and maybe a surprise or two, as the cherries on top. Tickets (tax deductible!) are available now at the link provided and can also be purchased at Oddbird Gift Emporium. Proceeds from this event directly benefit the volunteer programs offered by Faith in Action of the Greater Kanawha Valley.